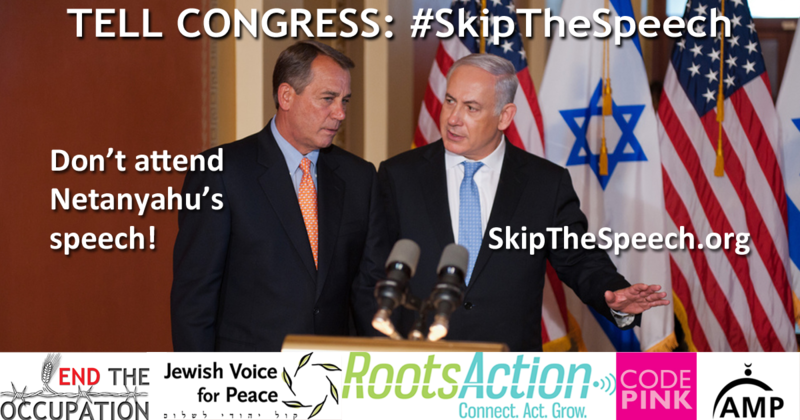 We are outraged that Israeli Prime Minister Benjamin Netanyahu was invited to speak before Congress. He does not speak about peace in good faith—illegal settlements and human rights violations against Palestinians have only increased under his leadership. Further, he will advocate for additional harsh sanctions on Iran that will undermine the diplomatic process and possibly lead to war. We call on all members of Congress to refuse to attend Netanyahu’s speech before Congress and to send the message that anyone who promotes war over peace is not welcome. Please add a comment if you like.